The Fifth Petal by Brunonia Barry was published on January 24th, 2017 by Crown. The New York Times bestselling author of The Lace Reader returns to Salem with this spellbinding new thriller, a complex brew of suspense, seduction and murder. When a teenage boy dies suspiciously on Halloween night, Salem’s chief of police, John Rafferty wonders if there is a connection between his death and Salem’s most notorious cold case, a triple homicide dubbed “The Goddess Murders,” in which three young women, all descended from accused Salem witches, were slashed on Halloween night in 1989. He finds unexpected help in Callie Cahill, the daughter of one of the victims newly returned to town. Neither believes that the main suspect, Rose Whelan, respected local historian, is guilty of murder or witchcraft. But exonerating Rose might mean crossing paths with a dangerous force. Were the women victims of an all-too-human vengeance, or was the devil raised in Salem that night? And if they cannot discover what truly happened, will evil rise again? About the author: Brunonia Barry is the New York Times and international best selling author of THE LACE READER, THE MAP OF TRUE PLACES, and THE FIFTH PETAL, which will be released in January 2017. Her work has been translated into more than thirty languages. She was the first American author to win the International Women’s Fiction Festival’s Baccante Award and was a past recipient of Ragdale Artists’ Colony’s Strnad Fellowship as well as the winner of New England Book Festival’s award for Best Fiction, a People Magazine Pick, and Amazon’s Best of the Month. Her reviews and articles on writing have appeared in The London Times, The Washington Post, and The Huffington Post. She is a regular contributor to Writer Unboxed. Brunonia chairs the Salem Athenaeum’s Writers’ Committee and serves on Grub Street’s Development Committee. 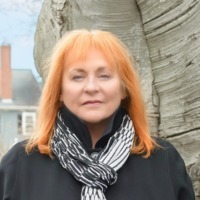 She is the Executive Director of the Salem Lit Fest, an annual event that brings people to Salem, MA from all over the world. She lives in Salem with her husband, Gary, and their dog, Angel. 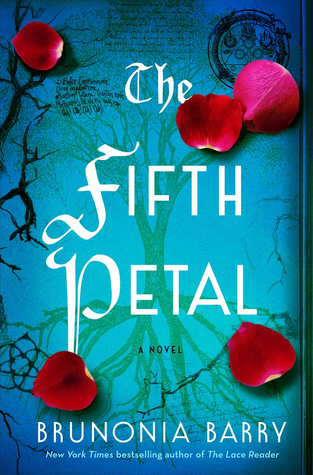 My thoughts: The Fifth Petal is the second book in The Lace Reader Book Series and can be read as a standalone novel. This story takes place in Salem with a dark mysterious history. In 1989, three young women were murdered and the crime is still not solved. It remains open after all these years but rumors and stories are still floating around town about what really happened to those three young women. The victims were thought to be witches. The descendants of women who were hanged for being witches in 1692. Twenty-five years later Callie returns to town wanting to know what happened to her mother that night all those years ago. Now with the help of the police chief she is trying to figure out what happened and why. Together they uncover all kinds of secrets some of which are missing pieces to the puzzle. While others are haunting secrets that involve the supernatural. Are the witches real? Is Callie a witch and doesn’t know it? This book is full of supernatural, mystery, action, suspense, family, and love. Barry has done a lot of research on this novel and it shows in her writing. The characters are intriguing with backstories that are well developed and help to add depth to the story. The setting of modern day Salem helps to add to the mystery of the overall story. I recommend this book to anyone who loves a good supernatural suspenseful mystery novel.